Our culinary/table garlic is carefully selected for eating purposes. It is available in 3 different ways: Either in bulk or by specific variety or through our Specialty Garlic page. All three options are available for shipping, starting September 1st and make excellent additions to any seasonal menu and recipe. They also happen to make pretty fantastic gifts, wedding favors, and stocking stuffers, too. Our bulk culinary garlic is a general mix of our favorite softnecks and hardnecks and is not sorted by variety. You get what you get (and its all delicious!) and that is why it is offered at a bulk discount. If you really want to try and taste all the different varieties of our garlic, then you can purchase culinary garlic by variety, too. It takes a TON of work to keep all our varieties sorted and maintained for this purpose. But it is soooooo worth it! 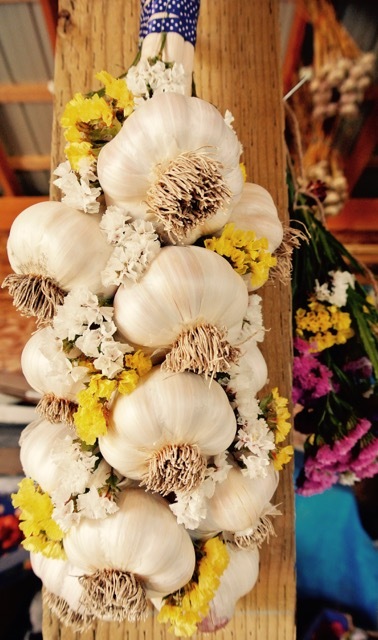 Explore our many different specialty garlic options, including braids, bouquets, samplers and more. One of our most popular options for eating the most beautiful garlic you have ever seen (or tasted! ).